This article was written by Henri de Villiers for the blog of the Schola Sainte-Cécile. We are pleased and grateful to translate and publish it here with the author’s permission, and that of the translator, Zachary Thomas. It has also been published on Canticum Salomonis. Until around 1999, our parish of Saint-Eugène in Paris was one of the few in France to keep up a custom that goes back to the first centuries of the Church. At Nuptial Masses,  two high-ranking clerics or two witnesses held a large white veil  over the kneeling couple during the nuptial blessing given by the priest between the Pater and the Kiss of Peace. 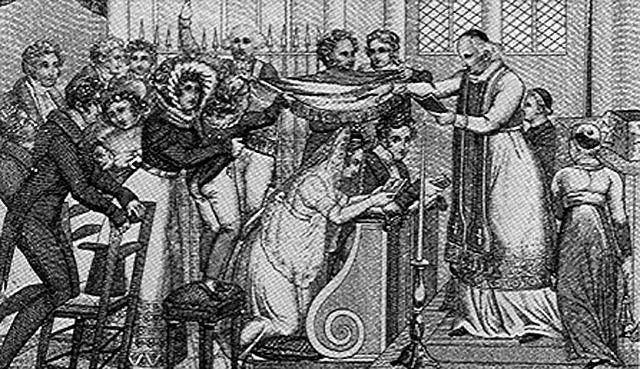 The same word poêle was also used in France to designate the canopy for the Corpus Christi procession and for the funeral pall, and for the canopies used for solemn receptions of a bishop or powerful prince. 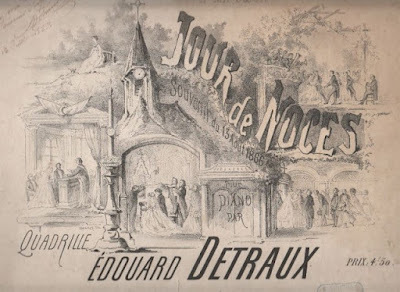 It lives on in the popular expression “Tenir les cordons du poêle” (“Hold the ends of the veil”) that refers to someone enjoying an honorary position. 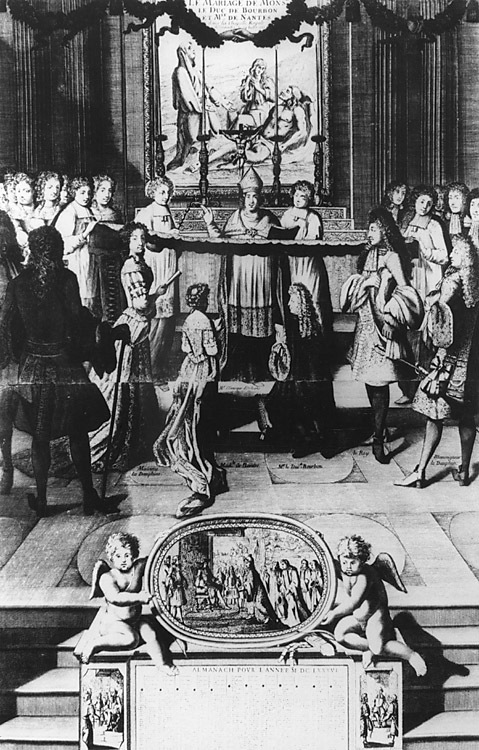 Jean-Jacques Dortous de Mairan, in his encomium for Cardinal André-Hercule de Fleury, points out that it was in virtue of his position as chaplain to the King that he had the privilege of holding the poêle at the wedding of the Duke of Orléans in 1692. 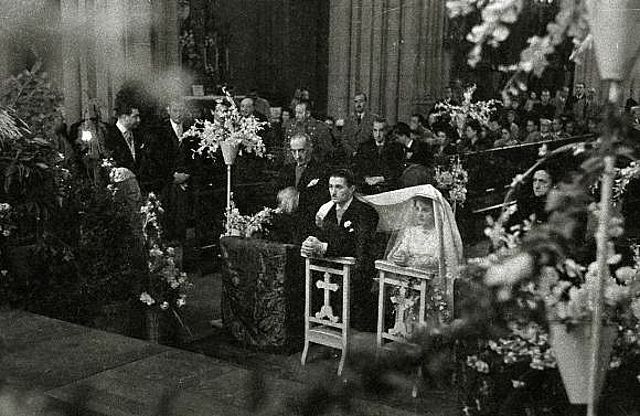 Far from being a simple folk custom proper to certain regions of France, the poêle for the nuptial blessing goes back to the earliest centuries, where it was a fundamental element of Christian marriage. Required by the Fathers of the Church, the origin of this rite helps us to understand the arrangements for marriage in the first Christian centuries in the West. 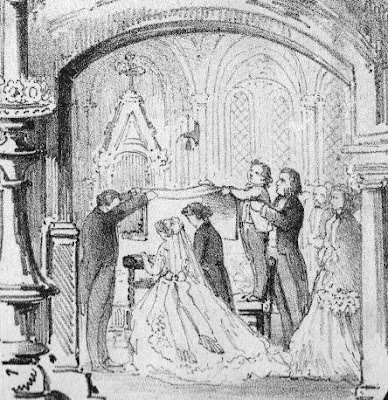 Gradually these domestic rites began to be held in the church (and at first in front of the church building), and there is a faint reminder of this in the traditional marriage rite (still followed in the 1962 books): the sacrament is celebrated before the Mass, which is later offered for the husband and wife already married. But originally the spouses gave themselves the sacrament of marriage in their own house by the exchange of consent. Nevertheless, the spouses then had, in a manner of speaking, to ratify this sacrament they had given themselves by receiving a solemn blessing at the church during a special Mass celebrated for their intention. This solemn, public confirmation of the sacrament given in private appears to have been well-established at least since the 4th century  and took the form of a ceremony performed before the priest in the church: the velatio nuptialis, or nuptial veiling. Contrary to what certain liturgists in the 20th century believed, the veil in question was not the veil that the bride wore on the marriage day (at that time every Christian women wore one, whether she was married or not), but rather a large veil stretched over the couple precisely as the title of the blessing in the Gregorian Sacramentary indicates: Oratio ad sponsas velandas. The question that worries Himerius and Pope Siricius’s subsequent response are very obscure: he wanted to know whether it was possible to give a second nuptial blessing under the veil. The Pope refused. But it is telling to see that the veiling of the spouses is a synonym for marriage in canonical questions about this sacrament from this time onward. 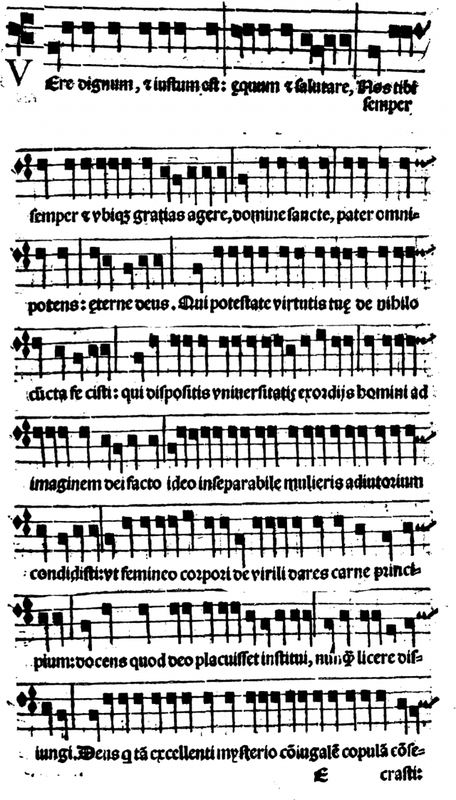 The same Pope Siricius wrote in 390 to many bishops and mentions the velatio nuptialis in passing. “Nos sane nuptiarum vota non aspernantes accepimus, quibus velamine intersumus. (We certainly receive, and do not disdain the vows of marriage, in which we have been present for the veiling. - Ep. 7, PL 13, 117). The wide attestation of this rite in the 4th century could lead us to think that the ceremony dates from before the Peace of Constantine. A text of Tertullian (ca. 150 - ca. 220) might also indicate that the nuptial blessing was practiced in Christian Africa in the 3rd century during the sacrifice of the Mass. “This union that the Church ratifies, that the sacrifice confirms, that the blessing consecrates, and that the angels celebrate, and that gladdens the Father.” (Ad Uxorem, II, 8, 6). In any case this citation shows that the marriage celebrated by the spouses in private is confirmed by the subsequent celebration of the holy sacrifice of the Mass. In 403, St Paulinus of Nola composed a very beautiful poem on marriage, an epithalamion written for the occasion of the wedding of the lector Julian (future bishop of Eclanum), son of the bishop of Benevento, to the daughter of the bishop of Capua. Paulinus describes the bishop of Benevento leading the couple to the altar, where the bishop of Capua gives them his nuptial blessing, who are both covered by the same veil. “Ille jugans capita amborum sub pace jugali, / Velat eos dextra, quos prece sanctificat” (He, joining both their heads under the peace of the marriage bond, veils with his right hand those whom the prayer sanctifies. Poem XXV, v. 226-227). 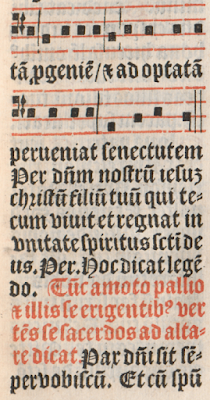 In the most ancient Roman liturgical books we find not only the text of this velatio nuptialis, but also the other texts for the Mass celebrated for the husband and wife. The Leonine and Gelesian Sacramentaries even include a special preface and Hanc igitur. In the Leonine Sacramentary, the most ancient witness of the Latin liturgy, the Mass is entitled Incipit velatio nuptialis. From the Gelesian Sacramentary, we know that this Mass for the spouses was celebrated a second time thirty days later, and on the day of their anniversary. It is highly significant that this blessing is given in the Leonine and Gelasian Sacramentaries in the form of a chanted consecratory preface like that of the canon of the Mass; in the Roman rite, chanting a preface signified a solemn consecration. This practice is retained of course in the Mass, at priestly ordinations, at the consecration of Chrism on Holy Thursday, and for the blessing of water on Holy Saturday. It was also done at the solemn blessing of water on the night of Epiphany, during the Vigil of Pentecost, and on Palm Sunday. The Sacramentary of St Gregory modified the structure of the Gelesian nuptial blessing by suppressing its preface form, but substantially retaining the ideas of the ancient text. 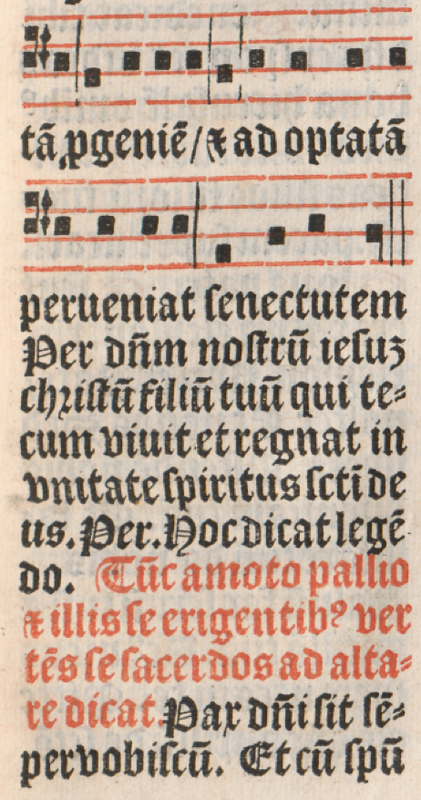 This is the form that passed into the Missal of Pius V. However, even after the publication of this Missal, Rome still used the more ancient form of the preface, which survived in many dioceses, especially in France, until the end of the 19th century. 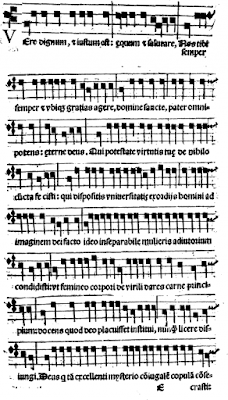 See for example the beginning of the nuptial blessing chanted in the form of a consecratory preface in the Sacerdotale Romanum of 1580 (pp. 32v to 34v). This book contains the official ritual of Rome and Venice before the Rituale Romanum of Paul V entered into force in 1614. Outside Italy we find the same ceremony in the liturgical books for the Hispano-Visigothic liturgy (or Mozarabic rite) and St Isidore of Seville mentions it. 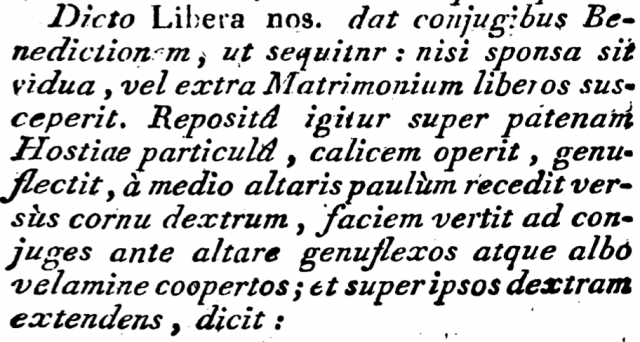 Even though its texts differ from the Roman, the velatio nuptialis accompanies the nuptial blessing. 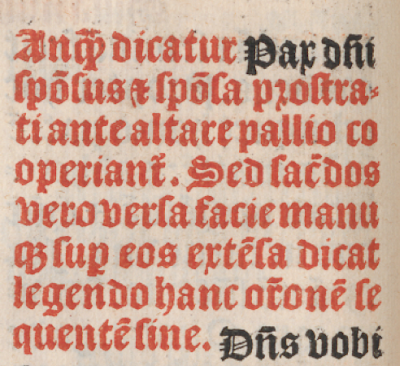 See the rubric in the Mozarabic Liber Ordinum edited by Dom Férotin. Note here that in Spain, the veil mentioned by the Roman texts takes the name pallium,  which was also adopted in France as poêle. One of the essential roles of the witnesses might have been precisely to hold the pallium over the spouses. What is the origin of the Christian velatio nuptialis? It is difficult to determine the origin of the velatio nuptialis. 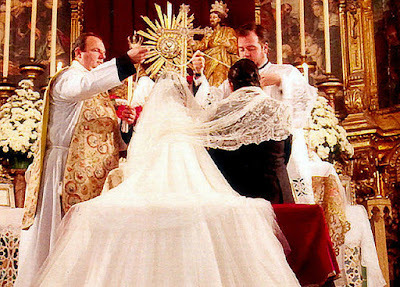 Some have thought that the veil spread over the couple is derived from Greek and Roman custom, but Roman marriage seems to have involved only a red veil for the bride, the flammeum, which is rarely mentioned by the Church Fathers and never in the ancient liturgy. 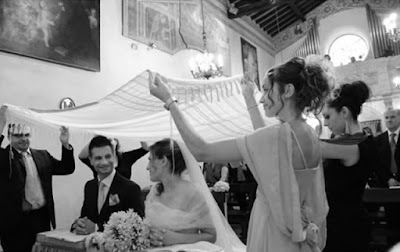 However, Greco-Roman influence cannot be excluded, since the idea of a veil is present in the etymology of the Latin and Greek terms for marriage: nubere (= to be veiled, covered), nuptiae connubium, νυμφίος. 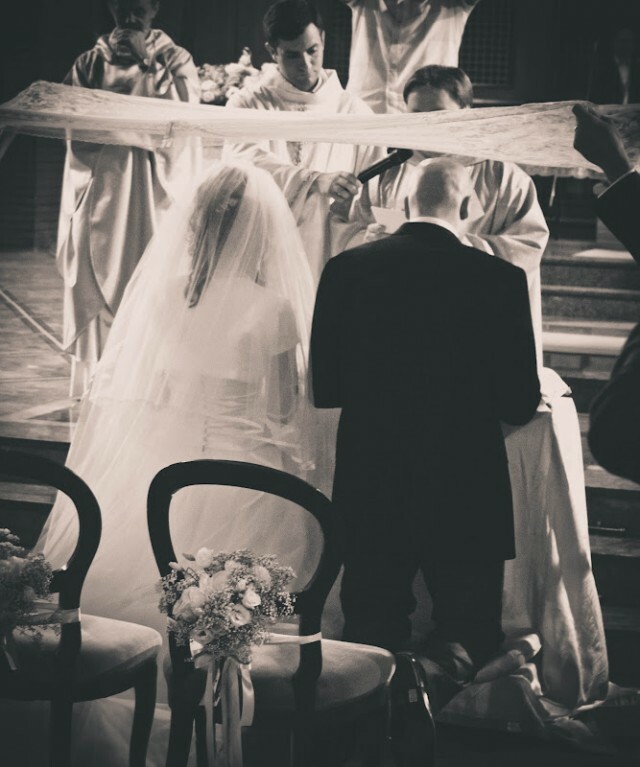 Modern-day Jews have a very similar rite, the use of a wedding canopy called “huppah”, but it is very difficult to find Biblical evidence for this practice. 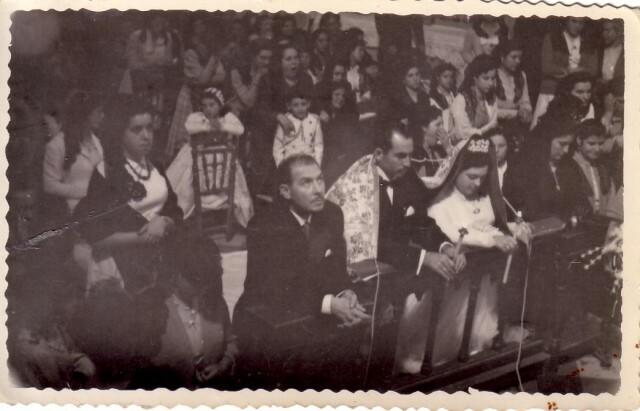 In fact, it is not impossible that the Christian ritual influenced the Jewish ritual in this respect, since the first Jewish author to speak of it, Rabbi Isaac ben-Abba Mari, in the 12th century, categorically disapproves of the introduction of the custom of holding a cloth over the bride and groom during the nuptial blessing. 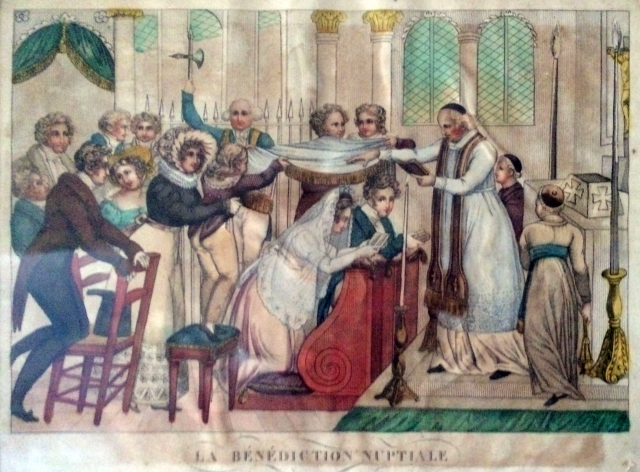 What is the meaning of the poêle or pallium of the nuptial blessing? 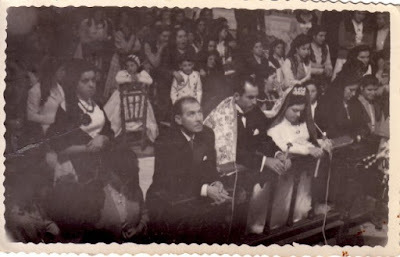 The white pallium stretched over the couple as they receive the nuptial blessing symbolizes the bright cloud, the manifestation of the glorious protection of God: the bright cloud that accompanies the chosen people’s wandering in the desert (Exodus 13, 20-22); the power of the Holy Spirit that overshadowed the Virgin Mary (Luke 1, 35); the bright cloud that appeared in the Transfiguration on Mt Tabor (Luke 9, 28-36; 2 Peter 1, 17-18). In Latin, the word for clouds (nubes), to marry and to veil (nubere) have the same etymology. The white pallium signifies the heavenly blessing that descends on the spouses, and thus the divine ratification of their mutual choice. 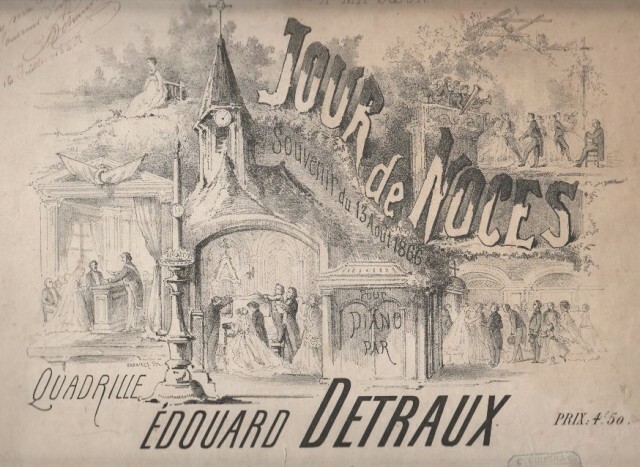 In Old French, the term poêle, as we have seen, is synonymous with the canopy used to honor both the Body of Christ on Corpus Christi and the person of a king or bishop. The poêle is therefore also a token of honor given to the couple at the moment of the nuptial blessing. In the Middle Ages the velatio nuptialis was in use constantly throughout all Christian Europe, wherever the Roman Rite spread. 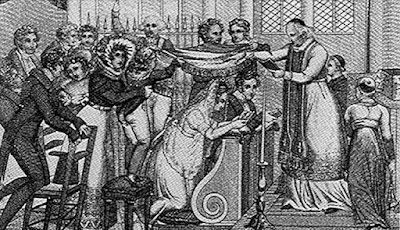 It is attested in France, Spain, and Italy as well as in England, where the pallium was called the “pall.” In 1321 the chronicles noted that King Edward II bought a sumptuous pallium to be put over the heads of Richard Fitz Alanand and Isabel le Despenser during their nuptial blessing. This custom was part of the Sarum Rite. The nuptial blessing/velatio nuptialis was given after the Pater and before the Kiss of Peace (the celebrant gave the peace to the groom who gave it to the bride). 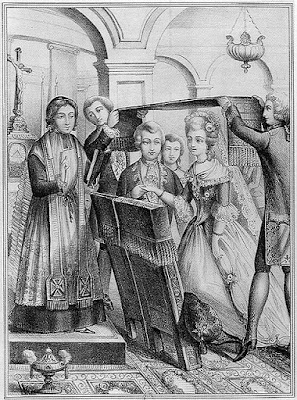 It is in the same position in the Missal of St. Pius V, even though the rubric indicating the spreading of the veil during the nuptial blessing was never written. This rubric never featured in the Missals printed before Pius V, but it was often marked in the various published Rituals. Before Pax Domini is said, the groom and bride, prostrated before the altar, are covered with the pall, while the priest, turning his face (towards them) and stretching out his hand, says this prayer that follows, without Dominus vobiscum. In the same work, another rubric specifies that the pallium is removed at the end of the nuptial blessing and that the priest continues the course of the Mass as usual with the Kiss of Peace. 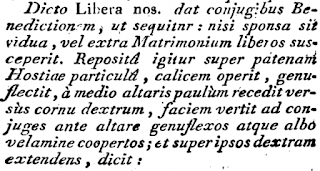 The Roman Ritual of Paul V (1614), a professedly minimalist and non-obligatory text, to avoid repeating the Missal, is content to refer to the text of nuptial blessing in the votive Mass for the bride and groom found in the Missale Romanum. In this way, and perhaps quite accidentally, the rubric about the spreading of the veil over the couple ceased completely to appear in Roman books, and so the most solemn action of Christian marriage in antiquity was gradually forgotten. But it is above all in Spain and the former Spanish colonies that the rite has been conserved to the present day. 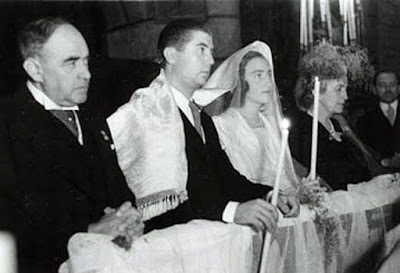 It passed from the Hispano-Mozarabic rite to the Roman rite over the course of the ages and constitutes one of the elements of what is called the Toledan marriage ritual. 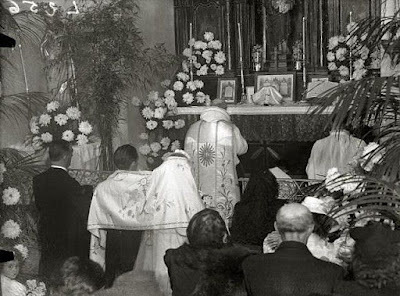 When consulted by the archbishop of Mexico in 1886 on the use of the marriage veil, the Sacred Congregation of Rites authorized the preservation of this traditional rite (n.3656). It is notable that contrary to the practice observed in France, England (as described in the Sarum books), and in Italy, the veil is not held above the couple but placed on the head of the bride and the shoulders of the groom. 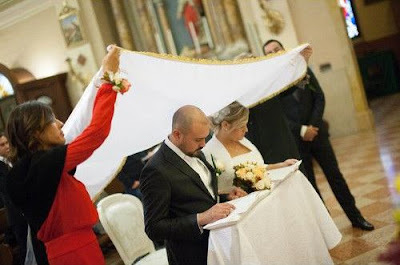 Besides Spain, the rite of the veil is present in America and in the Philippines; an article published here on NLM describes the practice in its traditional form. Custódi nos, Dómine, ut pupillam óculi, sub umbra alárum tuárum prótege nos. The beautiful symbolism and ancient roots of the marriage veil make us hope that this venerable custom does not become entirely extinct in France. We hope we will soon see more marriages under the poêle! 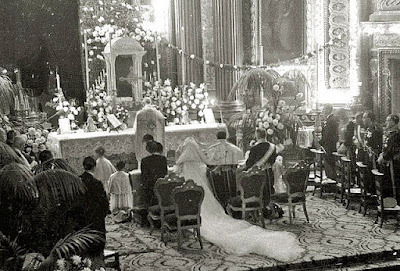 “Marriage Mass” is a misnomer, because in the traditional liturgy it is actually a Votive Mass for the Bridegroom and Bride who have been married before this Mass, as shown by the collect. We will return to this point a bit later in this article, since it helps us understand the reasons behind the velatio nuptialis. In practice, an altar or communion cloth was used. A piece of cloth with which one can wrap oneself. The garment of philosophers and the wise. Tertullian (c. 150-220) claims the use of the pallium as a distinguishing mark of Christians. In the Middle Ages, the term also referred to a rectangular banner. But it is certainly possible the ceremony existed even earlier, since the Christian theology of marriage was already well-established in the 3rd century, and even earlier. To be more exact, after the Pater, until in the 6th century St Gregory the Great moved it to the end of the Canon, following the example of the Byzantine rite. A blessing that exists in all the other Eastern and Western rites at this point, which disappeared from the Roman books in the course of the Middle Ages. The blessing given by the priest at the end of Mass is a more recent and meager replacement for it. Consequently, canonical questions relating to marriage are tied to the velatio nuptialis. Marius Férotin, OSB. Le Liber Ordinum. París 1904. “St Paul had formerly compared the virginal state to the spiritual marriage of the soul with Christ; and Tertullian, taking this as his starting-point, maintained that Christian virgins should wear veils on their heads, after the manner of married women. These ideas, when subjected to the influence of the Gallican liturgy, developed more and more in a mystical direction, so that a strange combination of ceremonies, taken from the marriage liturgy, replaced the early rite of the consecratio virginis, described in the Roman Sacramentaries—a rite which implied a simple eucharistic prayer and the velatio capitis. 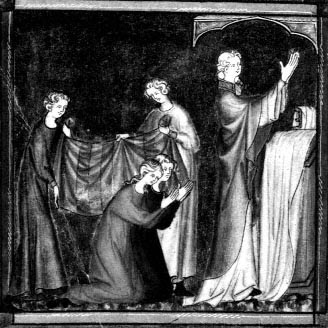 There we find the matrons, paranymphae; the consent to the profession of virginity; the subarrhatio with the ring, the velatio, and the coronatio; from all of which there resulted a magnificent and perfected ceremony, somewhat too emotional perhaps, and certainly detrimental to the theological sense which should dominate all these scenic accessories. There we read of nuptials, of golden bracelets, of vines with sweet-scented blossoms, of precious rings, of milk and honey tasted by the lips of the bridegroom, of his blood dyeing the cheeks of the bride, and even of an ethereal marriage-bed—ipsi sum juncta in coelis, quam in terra posita tota devotione dilexi—all these allusions showing, it would seem, no cognizance of the fact that we have to live here on earth, and have, moreover, to guard the treasure of virginity in weak and fragile earthen vessels.” (Cardinal Schuster, The Sacramentary). Analyse des conciles généraux & particuliers, Paris, 1773, Part II, Volume IV, p. 300. The nuptial blessing under the veil was no longer given at a subsequent marriage. The Council of Laodicea already imposed a penance for a second wedding after widowhood. St Augustine himself spoke of a “less honorable wedding” and St Thomas Aquinas said that in a second marriage there is a sort of “defective sacrament,” since even if it is full sacrament, its signification is nevertheless diminished. A rare witness to the use of wedding crowns in the West. The Greeks and Romans already crowned the newly-weds with flowers, laurel leaves, or other branches. The crown of flowers until recently used by French newly-weds is a vestige of this. The crowning of the bridegroom and bride has always been an essential part of the marriage rite in the East, and fulfills the same role as the Western velatio sponsalis: a solemn ratification of the spouses’ union before the community. Since the Ritual of Toledo implied that the veil remained over the spouses from the Offertory until the Pater, this custom must have had its origins in the practical step of just placing it over their shoulders.